An authentic, satisfying story, set in the rural fringes of Sonoma County, with garden wisdom and some very good recipes woven into a tale of a life reconstructed through hard work, friendships and a strong desire to make sense of the world. 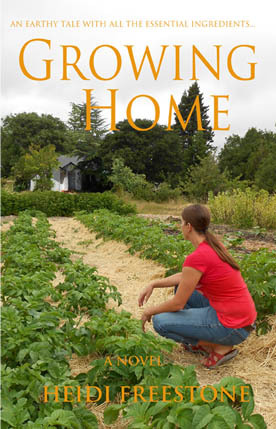 With her heart broken and worldview shattered, big-city refugee Sara immerses herself in learning how to grow her own food in rural Sonoma County, California. A grumpy reclusive neighbor understands sustainability and his garden proves inspirational, as does the work of Renny, a friendly gardener from a community garden. Best friend Jen, left behind in Chicago, is an emotional anchor as Sara’s new life slowly expands to include a young financial planner who shares Sara’s love of good food, and a flamboyant neighbor who helps Sara find catering jobs. Buying a flock of chickens on Craig’s list leads her into a healing relationship with an older man. Taking her locovore beliefs too far results in an arrest for poaching. 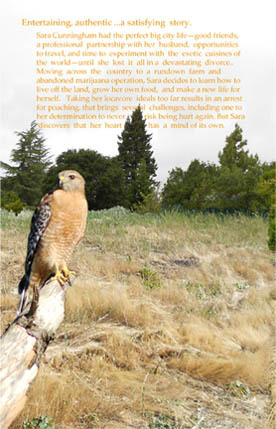 In the aftermath she strives to understand who she has become in this new life and to decide just how far to let Matt, the Department of Fish and Game officer who triggered her arrest into her life, and her heart. Growing Home’s beginnings are in a very short piece that I now call the Prequel. Its genetic soup is made of the many wonderful books, both high brow and low that I have consumed/inhaled/integrated/loved from the first ecstatic moment of deciphering the written word. Growing Home , the novel, is fleshed out with captured moments, and snippets of overheard lives. Fantasy (you have to love the freedom fiction gives you!) bridges the awkward gaps, and experience and persistent research binds the story to the real and possible. Books that are a mix of story and salient facts are my current preference, such as those by Nicole Mones (smuggling artifacts from China, Pierre Chardon and the Peking man, Chinese cooking) Judith Hendricks (baking), William Gibson (contemporary and beyond techno society). The gratification when a hero/ine achieves their goal after much struggle, which we share vicariously, but don’t actually have to suffer through, attracted me to Anna McCaffery’s books, especially Dragonsong and Dragonsinger, and those of Patricia McKillip, whose spinning of language is spellbinding. Inspired by the idea of pay-back for pleasure received I decided to add another entertaining story to the mix. Having been a gardener forever, and loving food and foodies, and the locavore movement, the facts for enveloping Sara’s dilemma and growth seemed obvious. If you have ever wanted to write a book or a story —do it. Just put pen to paper or fingers to keyboard and go for it. If you already have a story tucked away take it out and polish it. Growing Home has been three years in the making, some of that spent by being put away for a while. I believe a person can’t have too many editors. Even my absolutely brilliant and eagle eyed editor missed some goofs—so the backup of yet another set of eyes checking is invaluable. Createspace has made it possible for books that won’t please the “mainstream” but will delight the tributaries, to be much more widely available than ever before. And even if you make just a single copy and never share, the writing of a book is fun, hard work. Although I'm not as a committed cook as Sara, I do know her recipe for marinated mushrooms...Bring to a boil 1/4 cup rice vinegar, 2 tbl. sugar, 2 Tbl lime juice, 1 Tbl. soy sauce, 1/2 tsp. red chili flakes, 4 sliced garlic cloves. When sugar is dissolved remove from the heat and add 2 Tbl olive oil, 1 tsp grated orange rind, and 1/2 tsp grated lime rind. Pour over a pound of small button mushrooms and refrigerate overnight, stirring once or twice. The mushrooms will turn dark. Garnish with chopped parsely or cilantro.